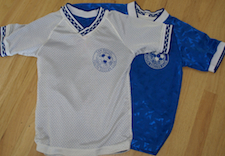 Under 6 through Under 10 - wear a blue/white reversible jersey with SRYSC logo on the front. Numbers on back are optional. 5th Grade through High School -Solid blue jersey with a SRS logo on the front AND a MISA logo on the left sleeve. All shirts must have a number (any number player wants from 1-99). 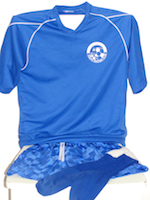 SRS black shorts and jerseys are also available at All Season Soccer on 4th Street, San Rafael. Recycled Uniforms, cleats and shin guards available in the blue boxes on the porch: 59 Rafael Drive to see if anything fits. Each player should also have his/her own ball and water bottle in his/her own equipment bag. How Do You Form Teams? U6 - U10 Age Group Coordinators assemble teams by trying to accommodate one special request per player to the extent possible. U12 through U19 Drafts are blind and designed to keep the teams evenly balanced with talent. Requests cannot be accommodated in the course of a blind draft. U12 and U19 players from outside San Rafael will be "clustered" together to help with carpooling logistics. Late sign ups will be assigned to the next team in need of a player and special requests will not be guaranteed for late sign ups (after July 1st). DON'T WAIT FOR THE SEASON TO START- Clean out your Closet and Come Now! DROP OFF what your child doesn't need. FREE Exchange - take or leave! Come by 59 Rafael Drive, (Dominican area) and take what fits your child. Plastic containers on Front Porch - no need to knock. Sign up for the Text Alert on the right hand side of the page. Coaches will call you when a game is Cancelled! Otherwise, show up to all scheduled games. Rain out games will be made up at the end of the season. How & When do I receive my volunteer refund? Volunteer refunds are given out at the end of the season. Be sure to submit your name to the Volunteer Coordinator with a description of date and job you completed. Some refunds are given early September for tasks completed during the pre-season. Can I get a Player Refund? Refunds are given out if the player removes themselves PRIOR to the first game, minus an administration fee. If a player decides not to play after the first game, there is no refund. The club does not refund for injuries that occur during the season.